Dr. Webb (Jim to me and to so many of those he counted as friends) was a trailblazing gifted field psychologist, educator, author, publisher, visionary, and humanitarian. He also was the founder of SENG (Supporting Emotional Needs of the Gifted) and Great Potential Press. Sometimes stars just go out, leaving the skies that much more dark and lonely. But the truly large stars can set the skies ablaze in a glorious supernova. Jim, like Mr. Rogers, was such a supernova. Jim may not have been a household name for everyone, yet Jim left a massive legacy that will live on and grow and positively affect countless lives across the world and across generations to come. I feel somewhat inadequate trying to piece together strings of words that can both adequately celebrate the remarkable person I knew Jim to be and also help me cope with my own feelings of loss for a very special friend, colleague, and mentor. Jim lived a life that represented what many philosophers grappled with expressing in defining a life of meaning. One of Jim’s influential books entitled Searching For Meaning is a tremendous examination of the gifted idealistic mind and the struggles required to make sense in striving for contentment and hope and meaning in a world that can be filled with chaos and confusion. It is a book each and every idealist should consider reading. The book could never have been written by anyone who did not live an authentic life following the wisdom the book offers. I am sitting here with my book copy in hand, inscribed by Jim with a hand-written message to me that brings me to tears whenever I read it. I recall when I first met Jim in person, when he invited me to attend a SENG conference. I sat in on his talk about existential depression that would later become the basis of Searching For Meaning. After his talk, he came to me wishing to hear my thoughts, but he could easily see that my face was streaming with tears. His is a wisdom that deeply understands. His is a compassion that deeply comforts. Jim founded SENG in the Department of Professional Psychology of Wright State University in Dayton Ohio. The history is well known by many people in the gifted field. The story of SENG involves the tragic suicide of a profoundly gifted young man named Dallas Egbert and the young man’s parents reaching out to Jim to find answers and hope so no other parents of gifted children need to grieve for their own child in such devastating circumstances. This story and SENG’s founding was unknown to me at the time (I was actually a student at Wright State University precisely during this period). Unknown to them, however, was that I had been a classmate if only for a brief time in middle school with Dallas Egbert. I’d never forgotten that experience, Dallas’s sad eyes, nor my extreme shyness as a child and feelings of inadequacy to offer any help or lasting comfort. That experience stayed with me, and perhaps was one influence in my eventual career helping others as a pediatrician. The circle truly became complete and gave significant meaning to my life once I had the opportunity to discover SENG and even work directly with SENG, as a board member, speaker, researcher, and eventually as chair of their advisory committee. I felt in some small way like I was finally giving back somehow, maybe giving back to all the kids like Dallas that I have known. And at each step there was Jim, my lodestar. Since our first conversations, Jim trusted in me. Perhaps more than I did. I don’t know if he truly realized how much that meant to me. We worked together to form the online informational SENG Misdiagnosis Initiative, we produced parent and clinician brochures, we spoke together on panels at conferences, and we worked together to increase awareness of the complexities of giftedness and the risks of medical misdiagnosis by gaining approval to have this topic presented not just one year, but two years, by the American Academy of Pediatrics at their national conferences. 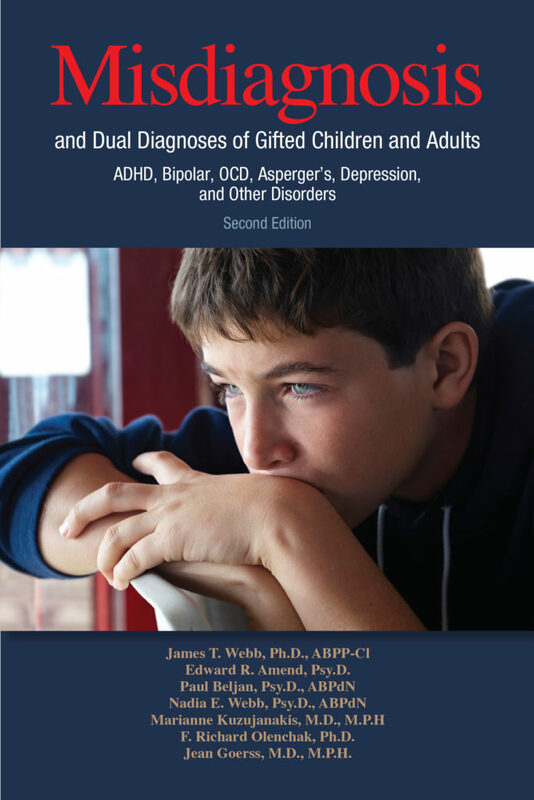 Jim even granted me the incredible opportunity to be included as an additional co-author of the highly revised and expanded second edition of the book Misdiagnosis & Dual Diagnosis of Gifted Children & Adults. Jim gave me the ability to accept my own giftedness, to feel comfortable with my own voice, and to forcefully express my own opinions. Ultimately, this was one of Jim’s messages to all of us. This is part of his legacy for all individuals – gifted or not gifted – around the world. That you are powerful. You are important. You are strong. You are perfect just the way you are. May Jim rest in peace. May his amazing family be comforted by the extraordinary life he lived and shared with us. He made OUR lives filled with meaning.